With his sixth place finish in Saturday’s Xfinity series race at Mid-Ohio, Elliott Sadler was able to keep himself in contention for a season title — something he’s been very used to during his eight years as a full-time Xfinity driver. While Sadler is still looking for his first season title, he’s been close to the top of the mountain, finishing in the top six in each of the past seven years with four runner-up positions to his name. Currently, Sadler stands at second in the Xfinity season points standings after his sixth place finish Saturday. Since the series came to the Morrow County race track, he’s finished sixth three times in four years. That consistency isn’t just on display at Mid-Ohio, as his season to date has been littered with top 10 finishes (17 in 21 races). When talking to Sadler before this year’s race, he noted that with a bit of luck, he could have finished better than sixth last year. While he did finish sixth again, it was on a track that the veteran driver who had competed at every level of NASCAR (main series, Xfinity and the truck series) over the past 23 years enjoys competing at. Sadler isn’t just involved in racing, as he’s involved with the Seconds Count initiative and partnered with AUVI-Q as a result of his son, Wyatt, being diagnosed with a severe peanut allergy before his second birthday. With AUVI-Q, Wyatt has an easily-carried source of medicine he can keep in his pocket in case of an incident. Sadler also noted that his son, currently eight, also has taken it upon himself to be aware of what he’s eating. 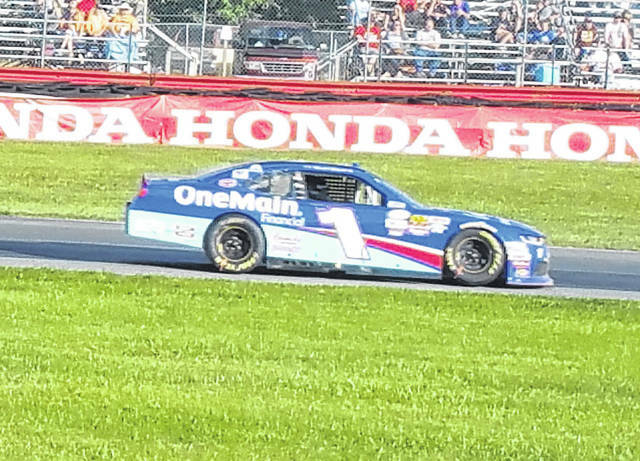 Elliott Sadler, shown running in the 2017 Xfinity series race at Mid-Ohio, is dueling for the season title in that series this year, as well as raising awareness for food allergies and what his family is doing to combat them with the help of his partnership with AUVI-Q.